Come join our growing international community! Join us at the Founders' Blog with Drs. Jerry Jampolsky & Diane Cirincione. We'll be adding new videos regularly, so come subscribe to our AHI channel on YouTube and you'll be notified soon as they're posted! AH International is a non-profit organization funded and supported entirely through tax-deductible donations. The support of a diverse, loving community is both our strength and inspiration. 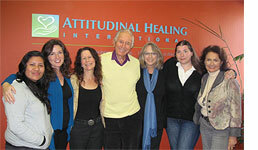 From left to right: Diana Alonzo (Youth Programs Coordinator), Lisa Redstone (International Communications Coordinator), Mariah Parker (Graphic Designer), Jerry Jampolsky (Founder - Attitudinal Healing), Anita Fieldman (Executive Assistant), Andrea Bernott (Systems Administrator), Diane Cirincione (Founder & Executive Director). The dedicated mission of Attitudinal Healing International (AHI) is the response to and support of the ever increasing number of independent Centers and Groups worldwide in their development, growth, training, and innovative adaptations of Attitudinal Healing. 2012 has been a truly spectacular year ignited by the greatly expanded growth of Attitudinal Healing around the world. Requests have soared for trainings and workshops and wanting to start Attitudinal Healing Support Groups and Centers. The most recent new locations are Washington, D.C. and Shanghai and Beijing, China. The growth in demand for AHI to respond to needs on six continents has been supported by the truly miraculous happenings of these last months. As a result of grants, donations, and serendipitous circumstances, AHI is now located in its permanent new office headquarters located in Sausalito, California, just four minutes north of the Golden Gate Bridge. Our beautiful 1100 sq. ft. space overlooks the Richardson Bay Wildlife Sanctuary and the houseboat community and nourishes us with a spectacular view each day. The office is furnished due to the generosity of Joyce and Larry Stupski and the Stupski Foundation. Office expenses for our first year have been graciously donated by Oscar Cantu. We are deeply grateful for the magnitude of these perfectly timed donations. The gracious and heartfelt support of Ted and Veda Stanley continues to be the cornerstone of the Jampolsky Outreach Foundation. Others are joining us in supporting AHI and we invite you to either contact us or go directly to www.AHInternational.org/donate-now to see how you can help. We, and so many others in the extended AH Community, are witnessing with ever increasing awareness the reality that, truly, your attitude IS everything, regardless of culture, age, circumstances, or beliefs. In these changing and often chaotic times, it is clearer than ever before that the Principles of Attitudinal Healing speak directly to being able to choose peace over conflict and love over fear in any and all circumstances. This is a powerful way to expand our choices in how we see and deal with everyday challenges and seriously increases our ability to have a happy and meaningful life. Attitudinal Healing Connection - Oakland in Northern California held its first gala celebrating its 23rd year of transforming communities. Their mission is to eliminate violence by offering creative and educational programs that transform the human spirit and build peaceful loving communities for all humanity. AHC - Oakland's offerings include Youth Leadership NOW trainings, ArtEsteem, Self as Super Hero, Mindful Drumming, Neighborhood Leadership Institute, as well as ongoing Support Groups and retreats. They have just recently completed the first of six murals as part of the Oakland Super Heroes Mural Project. Designed by local middle and high school students, this project gives youth the rare opportunity to have their voices heard. The AHC-Oakland Super Heroes Mural Project is West Oakland and Emeryville's first large scale mural revitalization and beautification project. Cecura Monterrey celebrated its 11th Anniversary in September 2012 with a visit from Doctors Diane Cirincione and Gerald Jampolsky. Founders and many Facilitators from 7 Cecura Centers for Attitudinal Healing in Mexico hosted by Cecura Monterrey came together to share what is going on locally with Attitudinal Healing as well as to learn from each other. It was incredibly inspiring to see how there are AH Support Groups in 27 cities in Mexico. Cecura Monterrey started a Circle Group at the main Monterrey Campus of the Instituto Tecnologico de Estudios Superiores de Monterrey (ITESM) in 2006, supported by the Student Affairs Department. One year later a second group was started and now takes place at Campus Eugenio Garza Laguera, a High School Campus of the same University. Diane and Jerry visited the ITESM on September 14, 2012 and were received by the Students Affairs Team who presented a video about the University System. Later that day, Diane and Jerry gave the lecture, "How to Let Go of Worry, Stress and Fear in a Changing World" to the Campus Community of students, professors, parents and Campus employees. In addition to the 150 people who attended, the presentation was transmitted through satellite to all the Mexico and overseas Campuses. The ITESM is a multi-campus university system with 33 campuses throughout Mexico. They have also established an international presence through 21 area locations and numerous liaison offices in 12 foreign countries. The message of Attitudinal Healing continues to inspire and ignite in Mexico. The Center for Attitudinal Healing in Costa Rica was founded by Diederik Wolsak who also previously founded the Center for Attitudinal Healing in Vancouver, Canada. 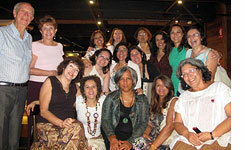 The Center in Costa Rica is quite unique and different from other AH Centers in the world and offers a retreat atmosphere for a variety of personal challenges. Some people stay there several months. The methodology combines Attitudinal Healing and other Universal Teachings. We were impressed with the depth of healing that takes place. We became part of the family and learned a great deal. The following is a recent summary of activities we received at AHI from Diederik Wolsak, Founder of Choose Again. 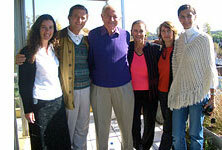 In January 2012 we at the 'Choose Again Attitudinal Healing Center' in Costa Rica enjoyed a joyful experience. As some of you know, Choose Again opened this Center almost seven years ago and has been helping people from all over the world overcome depression, crippling anxiety, and drug/substance abuse (legal and illegal) with remarkable results using the Principles of Attitudinal Healing and other Universal Teachings. Jerry and Diane's stay with us was truly a blessing in so many ways. 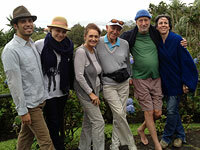 We do most of our transformative processing in the circle and Jerry and Diane joined us there. If someone had dropped in that day he or she would have seen a seamlessly functioning therapeutic team consisting not just of the Choose Again Staff, Volunteers and Clients but including Jerry and Diane. It felt to all of us as if they always had been part of our team and that is true, of course, in the deepest sense of the word. All of us are part of the Team we call Oneness, the Team we call Love and true Acceptance, and Jerry and Diane have led the way for so many years in spreading the Truth of that teaching all around the world. They now know that there is a residential facility which carries their message to those most desperately in need of the Truth and we look forward to a continuing dialogue between all AH International Brothers and Sisters! We are delighted to announce the commemoration graduation of our most recent class of Facilitators. There are 20 in all and they come from around this region of Brazil. The training was wonderfully taught by Ada Damio, Fetima and Ana Osanai. Everyone loved it very much and it was a very thorough training course. They are now ready to work with the AH Support Groups. We send our hearts greetings to the whole Attitudinal Healing International community. The Center For Attitudinal Healing of Buenos Aires was founded 20 years ago and Jerry and Diane have visited us three times. We also received the International Network with all the members in a big Regional Conference and each year we spread the spirit of Attitudinal Healing with projects such as 'Loss and Grief,' 'Letting Go of Worry, Stress, and Fear,' 'Choosing Peace Instead of Conflict,' and "Creating Wings To Wheelchairs." We help people learn to meditate and demonstrate the 12 Principles of Attitudinal Healing which are timeless and cross-cultural. This last January Jerry and Diane spoke to large audiences in Argentina and Uruguay. 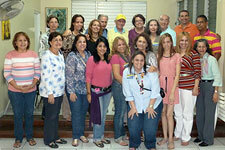 They visited with our Board and gave an evening talk to a full venue at the Acasuso Center. Every time we listen to the message of Attitudinal Healing, we have a new, growing experience. Their visit made possible the bonding between The Cierra de la Ventana Center (CAH - Centro Calquin) and founder Mariana Waisman with the Buenos Aires downtown Center. Since then, we did a training course together. Mariana lives in a small community of about 6000 people many hours from Buenos Aires. She hosts a daily radio program on AH. The Center there has seven AH Support Groups each week and has 40 trained and active Facilitators. In Uruguay they lectured at the Medanos Club in Punta del Este on Introduction to Attitudinal Healing, hosted by Veronica and Teddy Garcia Mansilla. The atmosphere was exciting and uplifting as many are interested in Uruguay now in Attitudinal Healing. Over the last 20 years we continue to experience profound healings occurring with the application of the Principles of AH. They are timeless and cross cultural. It is inspiring to see the growth of AH in South America. "A Blessed Island Where Miracles Happen"
Three years ago the first Santo Domingo's AH group started to meet in Dominican Republic led by Father Marciano Garcia, a priest, full of great wisdom, discernment and extraordinary love. The group met with assiduity and grew in the Spirit. Last year, Fr. Marciano suggested I invite Jerry and Diane to come to visit, and miracles soon began to emerge! They visited our group and offered a free community lecture where the participation of more than 500 people was extraordinary. The translation was done by Carlos and Lucero Aguirre, Founders of Cecura Guadalajara. It was a day when many hearts began to return to peace and love. It was the day Cecura Santo Domingo began its rapid growth and continued evolution. On the same weekend we had an AH Facilitator Training conducted by the Aguirres with about 250 people participating. Miracles continued and many people joined Cecura Santo Domingo. This year, after Jerry and Diane spread their love in Santo Domingo, our groups became a Center and today we have 20 Facilitators trained by Fr. Marciano. Of these Facilitators, two of them are incorporating AH in the university curriculum, specifically to medical students, others work with troubled teens, others implement AH at work and continously there are forming new AH groups. Cecura Santo Domingo is being legalized as a Non Profit organitation in order to expand and reach corners of our island where there is little peace or joy. Jerry and Diane: Thanks for being part of the miracle of Cecura Santo Domingo. We arrived in Ghana on August 7th where we visited with Kokomon's tribal family. From there we went to Abuja, Nigeria where Ambassador Ebun, Founder of CAH Nigeria, welcomed us. We felt relieved and blessed! We met with Michael Omotosho, president of CAH Nigeria, to discuss the pending AH 101 workshop for staff, and for the public one-day AH seminar "Leading From Within." We learned that evening that they were expecting nearly 200 people including television, radio and print media. There were 22 CAH Nigeria participants including Tasha Abdou, Founder of CAH Cameroon. AH 101 provided guidance as well as specific and helpful tools for the staff. This was an absolute joy for us. The workshop is a great way to strengthen connections and encourage members to engage in community building after the workshop, to support each other in deepening the understanding of the practical use of the Principles. After the workshop, we visited two orphanages where CAH Nigeria has an opportunity to provide training for the staff and children. We spoke with Ambassador Ebun about ArtEsteem and different creative outlets that could be used to engage the youth, who showed great interest, and the Nigeria Centre will be following up. We facilitated the "Leading from Within" Seminar. Two hundred people attended including business leaders, NGOs, students, and the general public. The Seminar was widely covered by television, radio and print media. Later in the evening we saw excerpts of the seminar on television news, shown to more than 10 million in Nigeria and throughout the world. On Sunday we visited Chief Elizabeth Akintonde who had attended the Seminar. She is interested in supporting the work, and spoke about our returning to Nigeria three to four times a year to train businesses, and offer trainings to nonprofits. She spoke about helping the Centre and her desire to build CAH Nigeria a permanent office near Ambassador Ebun's home. We are reminded to believe in miracles. Overall this Attitudinal Healing tour has been exciting and important for the growth of Attitudinal Healing in Nigeria. On August 17th Mary Clottey, Executive Director, CAH Ghana, and Aeeshah and Kokomon arrived in Kumasi. The following day we held AH 101 at the University of Education Winneba, Kumasi, with 71 in attendance, mostly students between the ages of 14 and 30. The group expressed the desire to go deeper, and is exploring the possibility of a virtual AH Support Group. The Ghana Centre has been a legal NGO for ten years, with the work focused primarily on support groups for children dealing with personal family crisis or learning difficulties. Attitudinal Healing has proven to be a powerful tool for improving the lives of citizens of Nigeria as well as for the young people in Ghana. We are all reminded to be the change we want to see. Thanks to AHI for sponsoring this Training Tour in Africa. We look forward to returning soon. Phoebe Lauren, former Executive Director CAH-Tiburon and also CAH-Sausalito has been living in France for about 15 years. This past year she was requested to give, and has begun, Attitudinal Healing workshops in various parts of France including Paris. We look forward to what will emerge. The Facilitators' course in Venice has begun. The group was very happy to learn about Attitudinal Healing. Many in the group have very sad life stories with family violence that has been kept hidden for many years. They are all excited about this new experience. Soon we will be training Facilitators in Rome. The love from our Center in Bari is expanding beautifully. 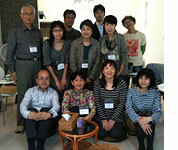 Attitudinal Healing Japan, which was founded in 2006, keeps growing. Now we have 16 regional AH Support Groups all over Japan, eleven of which are outside of Tokyo. We have AH groups on Skype, which provide highly safe environments for those who are living in areas without AH groups and those who feel they need especially high-level confidentiality. Now we are holding Introduction AH workshops twice a month, in addition to other workshops and trainings. We are thinking of ways to make them available outside of Tokyo. People who are not ready yet to actually join the workshops can access the content through books and DVDs. Personally, I am involved in various kinds of activities, not only as the Director of Attitudinal Healing Japan, but also as a psychiatrist and a former member of Parliament. I see patients, give lectures, talk in media, train specialists, and do some academic research, but these days I am spending most of the time writing books. The reason I am so committed to writing books is that I think it is one of the most powerful ways to introduce AH perspectives to those who are not familiar with AH. I write various kinds of books, which makes it possible for people with various kinds of interests to get in touch with AH perspectives. Jerry Jampolsky once told me I was a "magnet," because I connect different areas that normal people usually don't think of (i.e, politics, mental health, ecology, child-raising, social justice, crimes, peace-making, international affairs). To me everything can be viewed either love-based or fear-based, and the solution is always letting go of fear and choosing love! I feel I am blessed to be in the position to disseminate AH in Japan, but the most important thing for me is that I can live my personal life in AH way, which brings me a lot of inner peace. The CAH-Mongolia under the direction of Founder, Undarlaa, is moving forward rapidly in its implementation of the AHI curriculum, Power to Choose (PTC). In this last year alone, the Center has applied, been granted, and implemented a Swiss Development Agency grant for the Power to Choose program into five schools in the capital, Ulan Bataar. The youth in these schools are ages 12-15. It is a 12 week curriculum 3 hours per week. The goal of the PTC program is to help students deal with the pressures of school and life and to better equip them in addressing the challenges, choices, and changes they encounter in more peaceful and productive ways. CAH-Mongolia has just recently been given a Save The Children Japan grant to provide Attitudinal Healing training and curriculum to both staff as well as out of school programs for youth. Training trainers for these programs as well as Facilitator training for AH Support Groups is ongoing. Congratulations to Undarlaa and the growing staff for their exciting work. Recent requests from both Shanghai and Beijing, China to introduce Attitudinal Healing into their country have initiated a new level of training partially fulfilled through online, interactive workshops. Carolyn Smith and Trish Ellis, both Senior Trainers and Mentors with AHI, have successfully adapted the first of a number of curriculums to be taught through distance learning. With their mentoring, experiencial Attitudinal Healing Support Groups will begin in a number of locations around these two cities. With in person workshops planned for October of 2013, the online training as well as the availability of "Love is Letting Go of Fear" and "A Mini Course for Life" in Chinese will be excellent preparation. We appreciate your feedback on our new and evolving newsletter. Your comments are important to us!